Please read the following before selecting your One Stop A-Frame at the bottom of the page. As Shown at left, the ratchet hook needs to be run under the bar and back around to the tie down point. This will ensure that the rubber lined securing bar stays in position and does not lift up when tightening. It is recommended that the securing bars stand level with, or taller than, the slab itself. 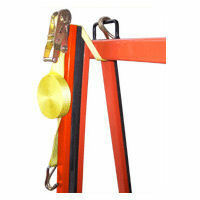 The securing bars will not work to their full potential if your material does not stand within the height of the bars. This is because the straps are not as strog as the ratchet securing bar. The securing bars are not to be used when carrying full slabs of material. To secure a full size slab on the A-Frame, use only the straps. Always make sure your forks are fully inserted into the A-Frame before lifting. This will ensure a proper and secure lift. All our One Stop A-Frames come with casters. Make sure the load is secured before removing the casters. Lift the A-Frame off the ground high enough for you to have proper access. With one hand holding the caster, use your other hand to pull out the retaing pin. This will release the caster from the frame. Place the caster in its holder. If you do this, you will never have to worry about misplacing or losing the casters.